Growing tired of the stress of corporate life, Andrea chose to trade-in her project manager hat for an apron. She journeyed to France to pursue a passion learning how to create delicate yet flavorful, French pastries. She brought the knowledge of French baking secrets back to Texas to open Bisous Bisous on the outskirts of Uptown. French macarons, which are very different from American macaroons, are petite pastry sandwiches in a rainbow of pastel colors and diverse flavors with a creamy center. American macaroons resemble small haystacks of toasted shredded coconut. Both are delicious in their own right – but distinctly very different. Andrea and her team create and bake over ten delightful flavors of macarons such as tiramisu, salted caramel, Tahitian vanilla, and passion fruit every day. Maybe you are looking for a taste that is uniquely you, such as a pistachio salted caramel or a raspberry tiramisu? Andrea’s got you covered. She will create and design custom flavors and colors for your party or corporate event. A rainbow of Macarons stacked in a tower makes a beautiful and stunning (not to mention delicious) display. Andrea and her team also bake muffins, cakes, and an assortment of croissants with smooth, creamy fillings. Their muffins are not a standard run-of-the-mill muffin found in every other bakery. These muffins are rolled with a variety of fillings such as cinnamon or chocolate. On top of each muffin is a dollop of flavored frosting with nuts, coconut, or festive candy sprinkles. The croissants have a flaky buttery-richness that make them a perfect accompaniment with a cup of espresso. Baking class anyone? You bring the wine. Bisous Bisous also offers baking parties. Bring a bottle of wine and 8 -10 of your closest friends for a customized weekend class. During a 3-hour class, you will learn the beginnings of the art of creating French pastries in your kitchen. By the end of the class, you just might feel like you are in France. 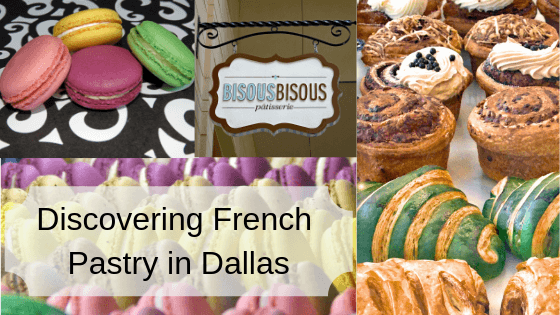 To sample authentic French pastries or to schedule a class to learn the delicate art of French baking, stop by Bisous Bisous at 3700 McKinney Avenue, Suite 150 in Uptown Dallas or call (214) 613 – 3570. You will be glad you did.